After a long day working, looking after children, or maybe both, the last thing most of us feel like doing is a time-consuming make-up removal routine. Dealing with stubborn eye make-up can feel like a particular effort, though the alternative, waking up to a streaky face and eyelashes ‘stuck’ together, is an even worse prospect. Halo Eye Make-up Remover Pads are quick and effective and get the job done when all you want to do is hit the pillow, go to sleep and wake up fresh faced. Hypoallergenic and fragrance free, Halo Eye Make Up Remover pads are gentle on the delicate skin around the eyes, yet are still effective enough to remove stubborn make-up such as waterproof mascara. 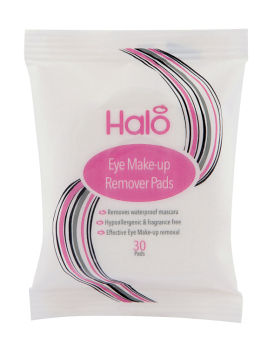 Halo Eye Make Up Remover pads, which come in packs of 30, are not only convenient to reach for at the end of a long day, they also provide a convenient solution for travelling, packing neatly into an overnight bag.